We had some requests to put Paul Curtis's Tumbling Tips on the website after he shared lots of information with us at one of our meetings. I went down and visited with Paul for a while the other day and he handed me this book and said that anything you need to know about Tumbling was in this book. 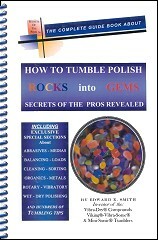 He says he uses it everyday and that if you are serious about doing tumbling that this is a must need book. It talks about Rotary and Vibratory tumblers. It talks about different stones and their Hardness factors and has the Moh Scale in it. It talks about the different stages of tumbling and even talks about grits and such. So if you want to be a pro at tumbling like Paul is, you definitely need to order this book. I just searched the book title online and found several places to order it from or it can be found in catalogs like the Diamond Pacific Catalog.